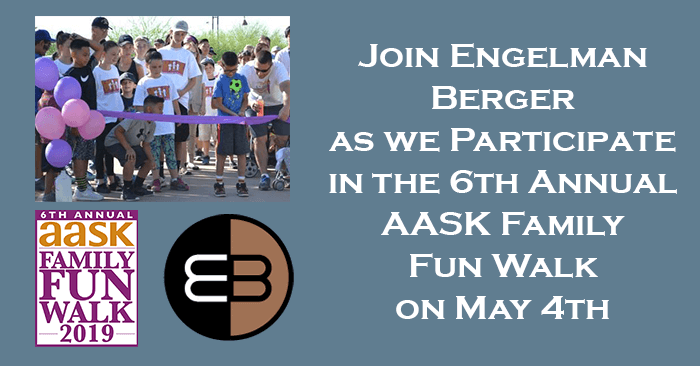 Come join Engelman Berger on Saturday, May 4th, as we participate in the 6th annual Aid to Adoption of Special Kids (AASK) Family Fun Walk. We are forming a team and raising funds in support of this amazing and impactful organization that connects children with foster families, adoptive families, siblings, kin, and adult mentors. To join Engelman Berger’s team or to donate funds towards AASK, visit this link http://familyfunwalk.org/teampage.asp?fundid=896#.XIXB3s9KiCR. The walk will take place at Steele Indian School Park, Phoenix Green Area, 300 E. Indian School Road, Phoenix (entrance off 7th street). Registration opens at 7:30AM and the walk begins at 8:30AM. The AASK Family Fun Walk is a 1.5-mile loop around the park that begins and ends in the walk’s expo area where families, friends, and children of all ages can enjoy music, food, games, and activities. We hope to see you there!